We believe in waterproofing all installations with epoxies and urethane sealants. We design the water to run “off” and not undermine the concrete base. In some situations, mud jacking or even replacing damaged concrete must be done before we install Lusterstone. We address sawing in new control joints and all other situations in order to achieve the best results. The concrete has to move somewhere! We design Lusterstone to move at the joints and to not randomly crack. Know this, we are also your source for stone flooring in Omaha, Nebraska. We use smaller stones mixed with 20% more Epoxy than industry standards. It costs 20% more but lasts better and longer. We strive to offer the best product for our customers. Our professionally-trained installers will arrive at your house with the right equipment and skill set to deliver exceptional, long-lasting results. Fully licensed and insured, you will surely be impressed with our efficiency and professionalism. Best of all, your Lusterstone will be ready to use in 24-48 hours! 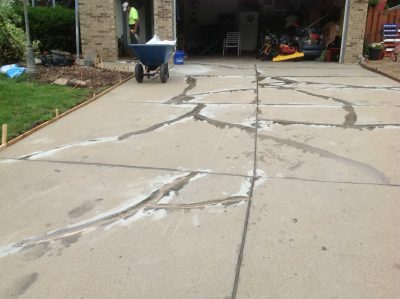 For driveway installations, drive on Lusterstone in less than a week! Payment is due upon completion of the project, ONLY after customers are satisfied with the final clean-up and final look of their Lusterstone.